Ocean Dreams Video Slot Guide & Review - Casino Answers! 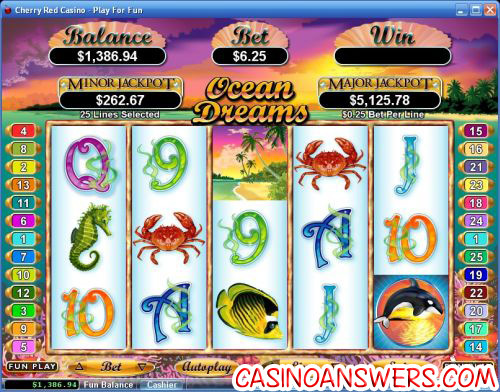 Ocean Dreams is a 5-reel, 25-line video slot developed by Realtime Gaming, featuring two wild substitute symbols, scatter wins, multipliers, a free spins feature, a bonus feature and two progressive jackpots. You can play the Ocean Dreams Real-Series Video Slot casino game at US-friendly online casinos Cherry Red Casino and Slotastic Casino. Bets on the Ocean Dreams online slot machine are $0.01, $0.02, $0.03, $0.04, $0.05, $0.06, $0.07, $0.08, $0.09, $0.10, $0.25, $0.50, $1, $2.50 and $5 per line. Use the arrows next to “Bet” to set your bet per line. You can play from 1-25 paylines. Use the arrows next to “Lines” to set your number of selected paylines. Ocean Dreams is a penny slot, meaning you can bet as little as one penny per spin when playing. The most you can bet on a spin in Ocean Dreams is $125. There is a skill stop feature for those who wish to manually stop the reels. Ocean Dreams is great for not only casual players, but high rollers as well. To play Ocean Dreams, simply press the “Spin” button. Ocean Dreams has two wild symbols. First there is the regular Orca symbol. The Orca symbol substitutes for all symbols, except for the Gold Orca and Scattered Island symbols. When you hit 5 Orca symbols on a selected payline, you will win 10,000 coins. The other wild substitute symbol on the Ocean Dreams slot game is the Gold Orca symbol. During regular slot games, it will only appear on the third reel. The Gold Orca symbol will substitute for all symbols except for scatter symbols. When the Gold Orca symbol participates in a winning combination, it will double your winnings. If you hit 4 regular Orca symbols on a selected payline with the Gold Orca on the third reel, you will win 20,000 coins. The Island is the scatter symbol on the Ocean Dreams video slot. It will pay out 1X, 3X, 20X or 500X your total bet if you hit 2, 3, 4 or 5 symbols anywhere on the reels. Also, if you hit 3, 4 or 5 Scattered Island symbols anywhere on the reels, you will win 10, 25 or 100 free spins respectively. You will also receive a 2X multiplier, so all of your winnings will be doubled. During the free spins feature, the regular Orca symbols will be turned into Gold Orca symbols. You will then have the chance to win up to 40,000 coins during the free spins feature if you hit 5 of a Kind Gold Orcas. Additional free games can be won during the free spins feature. Free games are played at the paylines and bet of the triggering game. That’s not all as far as good payouts go on the Ocean Dreams slot machine. The Fish symbol will pay out 1000 coins (2000 with a Gold Orca symbol) and the Seahorse symbol will pay out 750 coins (1500 coins with a Gold Orca). After the free spins feature is over, if the free games win is 10X the triggering bet or less, you will trigger the Win-Win feature on Ocean Dreams. If you managed to go through the free spins feature without any wins, you will win 1000X your bet. If you won less than 2X your bet, you will win 100X your bet. If you won between 2-5X your bet, you will win 20X your bet and if you won 5-10X your bet, you will win 5X your bet. Ocean Dreams has two progressive jackpots – Minor Jackpot and Major Jackpot. At the time of this writing, the Minor Jackpot is at $265, whereas the Major Jackpot is at $5,250. While the Minor Jackpot looks measly by comparison, a $265 win is nothing to shake a stick at. Both of these jackpots are triggered at random, meaning you don’t need any winning combination to win. Progressive Jackpot wins are added to other slot game wins. To try and win either of these progressive jackpots, start playing the Ocean Dreams online slot now at Cherry Red Casino! Hit the “Autoplay” button to open the autoplay settings on the Ocean Dreams slot game. You will be able to set the number of spins, set it to stop when the jackpot is won, stop if a win exceeds or equals (any amount you input), stop on any win, stop if your balance increases/decreases by any amount you input and stop once the feature is triggered. You can stop Ocean Dreams’ autoplay mode using the “Stop Auto” button. To speed up the gameplay, simply hit the “Turbo Play” button in the autoplay mode. Ocean Dreams is a new video slot from Realtime Gaming and you can tell by its very modern presentation. With not one but two wild symbols, lots of huge payouts the equivalent in size to a Killer Whale, two progressive jackpots, a free games feature and so much more, you simply can’t go wrong by playing the Ocean Dreams slot machine at Cherry Red Casino! 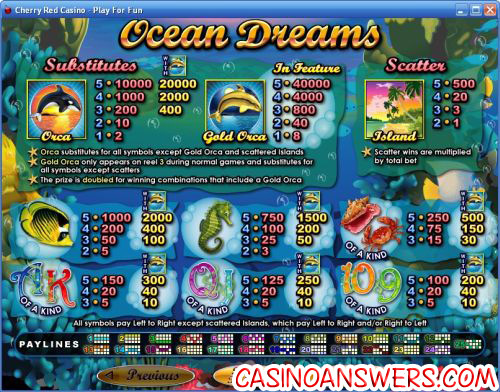 Is the Ocean Dreams video slot US-friendly? Players based in the United States of America are welcome to play the Ocean Dreams slot game at both Cherry Red Casino and Slotastic Casino. For more details, you can read our in-depth review of Cherry Red Casino. Is there a free Flash game of the Ocean Dreams slot machine? Unfortunately, Cherry Red Flash Casino and Slotastic Flash Casino only offer a limited amount of their games for Instant Play and Ocean Dreams is not one of them. How do I win one of the Ocean Dreams progressive jackpots? All you have to do is play and hope luck is on your side to win either the Minor or Major Jackpot. The jackpots are both triggered at random. What is the difference between the regular Orca wild symbol and the gold one? The regular Orca symbol is the game’s regular wild symbol. It will appear on all of the reels and has no special qualities. The Gold Orca symbol is also wild, but it only appears on reel 3. The Gold Orca symbol doubles your winnings when it participates in a winning combination. During the free games feature, the Orca symbols will all be converted to Gold Orcas with a top jackpot of 40,000 coins! Where can I play more ocean-themed slot games? There is no shortage of aquatic slot machines, such as the Crystal Waters Video Slot, Ocean Treasure Video Slot and the Bermuda Triangle Classic Slot Machine. What casinos have Oceans Dreams?